Constraint-Induced Therapy, developed as a rehabilitation technique following stroke, appears beneficial for patients with multiple sclerosis.A rehabilitation technique originally developed for stroke has now been shown to also be effective for improving function for people with multiple sclerosis, a neurodegenerative disease. According to findings from the University of Alabama at Birmingham published in Neurorehabilitation and Neural Repair, Constraint-Induced Movement Therapy produced marked improvement in activities of daily living for patients with MS, and the improvement persisted for at least one year. In a second paper published in the same journal, the authors report improved white matter structure within the brains of MS patients following CI Therapy, indicating the therapy produced measurable changes in the brain at the end of the treatment. 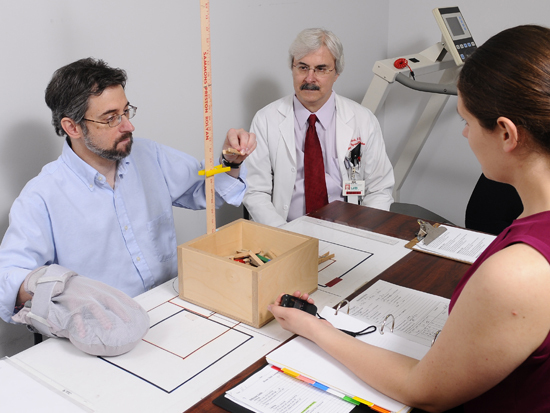 CI Therapy was developed at UAB by neuroscientist Edward Taub, Ph.D., originally as a rehabilitation technique for stroke. The therapy works on the theory of learned non-use, which asserts that following stroke or other motor deficit when a limb is impaired, patients learn to not use it for daily activities. They therefore switch to using the better limb for all daily activities. That learned non-use continues, even after the acute phase of injury has passed. Taub postulated that, after effective therapy, the brain could rewire itself following injury, and that movement of an affected arm or leg could be improved. CI Therapy involves restraining the less-affected limb combined with intensive training of the more-affected limb on movements and activities of daily living. Additional techniques are incorporated in CI Therapy, including behavioral shaping, which involves approaching motor goals in small increments coupled with positive encouragement, and a set of behavioral procedures to facilitate transfer of the training benefits from the clinic to the real world, which is called the transfer package. CI Therapy has been shown to be effective in boosting patients’ ability to perform activities of daily living in a variety of conditions, including stroke, cerebral palsy and traumatic brain injury. Mark says MS has similarities to stroke in that a great many patients have a greater motor deficit on one side, which in turn sets up the condition for learned non-use. The current study focused on use of the upper extremity and enrolled 20 patients with MS, assigned to either CI Therapy or a therapy called CAM — complementary and alternative medicine. The CAM group underwent 35 hours of holistic exercises such as pool exercise and yoga. The CI group in contrast received 35 hours of intense rehabilitation over 10 days, along with shaping and the transfer package. Each patient’s functional ability was recorded on a patient-reported Motor Activity Log taken at pre- and post-therapy. In the second paper, Mark and first author Ameen Barghi, a former UAB student now at Harvard Medical School, looked at the integrity of white matter in the brain. White matter is made up of myelinated axons, which are thought to be important for learning and other brain functions. White matter also serves to transmit messages between neurons, which are found in the other major brain component, gray matter. Patients with MS usually experience a progressive decline in the integrity of white matter. Mark and Barghi used magnetic resonance imaging to examine 10 subjects who had undergone CI Therapy patients and 10 who had received CAM. Previous studies by Taub also indicated positive changes in gray matter following CI Therapy in patients who had stroke or cerebral palsy. Mark says the next steps include a study of potential benefit to the lower extremities for patients with MS, and he is also interested in discovering how long the beneficial effects last and whether a refresher course of CI Therapy would be helpful. Funding for the studies was provided by the National Institutes of Health and the National Multiple Sclerosis Society. Co-authors on the motor function study are Taub, Gitendra Uswatte, Ph.D., David Morris, Ph.D., Gary Cutter, Ph.D., Terrie Adams, Mary Bowman and Staci McKay. Co-authors on the white matter study are Taub, Uswatte, Jane Allendorfer, Ph.D., Brent Womble, Jarrod Hicks and Jerzy Szaflarski, M.D., Ph.D.